Sugar Trail Slot is Quickspin backed online video slot game. The game has 5 reels and 20 paylines. You can select coins per line to 1 and coin size from 0.40 to 80 per spin. 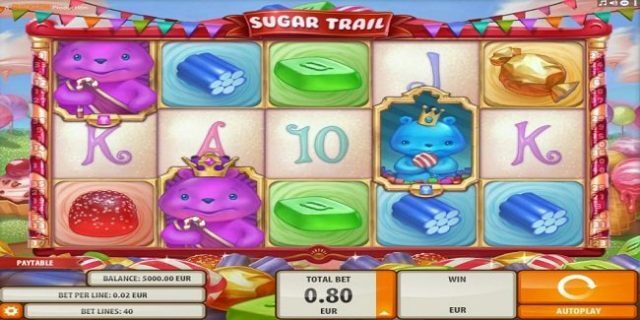 As the name suggest Sugar Trail slot is inspired by sugar and sweet. This slot game is very colorful and funny. 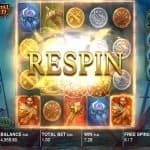 The reels of the game are being set against funny background.Play this slot game at any Quickspin Casinos. This slot includes total three options such as “Total Bet” which used to change the coin size, “Spin” is used to start the game and “Auto Play” option. 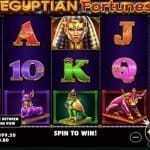 This slot game contains three wild symbols known as Regular Wild, Flying Wild and Re-Spins Wild. All three wild symbols can be substitute for all other symbols except the bonus symbol and for also +1 Free Spin symbol. The three wild symbols i.e. Regular Wild appears while base game, Flying wild symbols get on during free spin feature and re-spin wild symbols appears on the reels during Re-spin feature. If you land on 3 or more Purple Gummy Bear on reel 1,2 or 3, you would trigger wild candy free spins. Another feature i.e. Sugar Lock Re-spins will appear when you land on 3 or more Green Gummy Bear queen symbols on reel 2,3 or 4, while sugar cash bonus feature will be activated when you land on blue prince gummy bear scatter anywhere on reel 3,4 or 5. 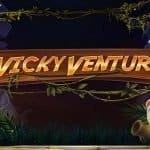 You could simply win big amount of money while playing this slot game.